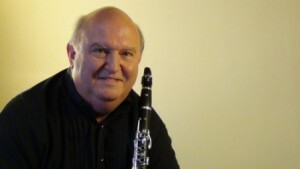 Leslie – long standing Principal Clarinettist of Welsh National Opera, retired from the position at the end of September 2018. He was appointed by Maesto Carlo Rizzi twenty five years ago and in his last season of Opera was singled out by many of the national press out for his outstanding artistry in substantial solos in performances of Forza del Destino (Verdi) (notably Act 3 Prelude and Aria del Alvaro) and Tosca (Puccini – the aria “E Lucevan le Stelle”). As a child aged 11 he was invited to play with the London Philharmonic Orchestra a unique opportunity to play with a professional orchestra under the Baton of Sir Colin Davis. Solo Concertos and appearances on T.V. Leslie has played many concertos all over the world notably on television in UK: the Mozart concerto live from St David’s Hall Cardiff, the Fantasia da Concerto “La Traviata” on T.V. in South Africa and Weber 2nd concerto in Portugal. He performed the 2nd performance of the Alun Hoddinott first concerto at the Royal College of Music shortly after it’s recording by Gervase De Peyer in the 1970’s. He has also been the dedicatee of several concertos written for him: notably the “Pied Piper of Hamelyn” by Vasco Hexel and the Concerto “Ambidexterity” by Roma Cafolla. His definitive recording of the Christopher Ball Concerto (written for and dedicated to him) is available for sale on this website. Before he became world renowned “2CELLOS” star Stjepan Hauser recorded two CD discs with Leslie and since then has had huge success and was signed by Sony records to record numerous albums. 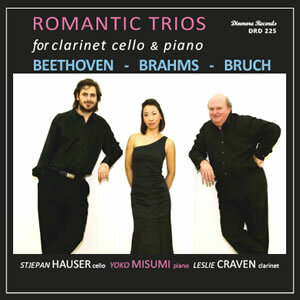 Leslie Craven is also featured on solo discs and numerous chamber music recordings, some of which have been written especially for and dedicated to him – notably, many of the works on the “Expressions” disc of lyrical contemporary pieces and the Concerto for clarinet and strings by Christopher Ball (see CD page) plus the Clarinet Quintet by Christopher Ball and the new CD “Inspirations” featuring the music of Roma Cafolla with virtuoso friends. He has a vast recital repertoire and has also performed many concertos in countries as distant as America, Canada, South Africa, most of Europe and for many international Radio and T.V. networks. In his role as a principal clarinettist he has recorded with Vladimir Ashkenazy, Gidon Kremer, Rostropovitch, Alfredo Kraus, Bryn Terfel, Jose Carreras, Placido Domingo, Renee Fleming, Marcello Alvarez, Stjepan Hauser, and many other great artists. During his freelance career in London he was highly sought after in studios, playing on soundtracks for films and for TV series and commercials (aka Jingles). Films he played for include Howards End (with Anthony Hopkins), Mickey Blue Eyes (with Hugh Grant), The Pope Must Die (with Robbie Coltrane), The Wicker Man (original version with Britt Ekland and Edward Woodward), The Pirate Prince and many more. T.V. series include amongst others; House of Eliott, Soldier, Soldier, Anna Lee, the Michael Aspel show and Wogan. He appeared also on the sound track for the background music to the Barcelona Olympics with Placido Domingo and Sarah Brightman. He also played for West End Shows such as Phantom of the Opera and was a member of the chamber ensemble (hand chosen by Michael Reed – who was at the time Andrew Lloyd Webber’s executive musical director) for Aspects of Love and featured on the cast albums and compilation discs of most of Andrew Lloyd Webber’s musical hits. Leslie also recorded for many commercials including: Ribena, Levi, Renault, McDonalds, Lindt chocolates, Ariel, Cheerios and many other household brands. As well as numerous classical and operatic orchestral discs he also recorded backing tracks for Charlotte Church, Cilla Black, Michael Ball, Michael Crawford, Barry Manilow, Rod Stewart, The Pet Shop Boys, Richard Clayderman and many others. Leslie’s work as a teacher and pedagogue is known internationally and he is considered one of Britain’s foremost teachers of clarinet and one of the most exciting players in the English style. Leslie teaches at the Royal Welsh College of Music and the University of Cardiff School of Music. 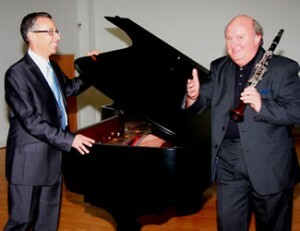 He has given master classes throughout U.K. in most of the major teaching establishments including: the Royal College of Music, Trinity Laban, Birmingham Conservatoire, South African College of Music Cape Town, Hong Kong Academy for the Performing Arts, School of Music, University of Caldas, Colombia, Utiel-Requena Union de Musica, Spain. Leslie has written a teaching/playing treatise about the clarinet, called “Instant Help for Playing and Teaching the Clarinet” which is available to download as a PDF and is recommended reading on the A.B.R.S.M Diploma Course reading list . see book page in LESLIE CRAVEN’s products.